The Westland Wapiti was a British two-seat general-purpose military single-engined biplane of the 1920s. It was designed and built by Westland Aircraft Works to replace the Airco DH.9A in Royal Air Force service. The Wapiti is named for the wapiti, also known as elk, one of the largest species of the deer family and one of the largest land mammals in North America and eastern Asia. In 1927, the British Air Ministry issued Specification 26/27 for a replacement of the elderly Airco DH.9A, designed during the First World War which still equipped the Royal Air Force's General Purpose squadrons. To save time and money, the specification called for the use of a high proportion of DH.9A components, (as the RAF still held large stores of DH.9A spares), while it encouraged the use of an all-metal structure. A large number of types were tendered to meet this requirement from most of the major British aircraft manufacturers, including Westland, who submitted the design that later became known as the Wapiti. Westland had an advantage in that it had carried out the detailed design work for the DH.9A, and was already a major contractor for the DH.9A. The Wapiti was a conventional single-engined equal-span two-bay biplane with a slight wing stagger. It had tandem open cockpits and a fixed main undercarriage plus a tailskid. The forward fuselage was of metal tube structure with aluminium-and-fabric covering, while the rear fuselage was of fabric-covered wooden construction. The wings and tail were standard wooden DH.9A components, although later models replaced the wooden parts with an all-metal structure. The Wapiti was powered by a single Bristol Jupiter radial engine, and its crew of two were armed with a forward-firing Vickers machine gun and a Lewis gun for the observer, while it could carry up to 580 lb (264 kg) of bombs under the wings and fuselage. It was also fitted with radio and photographic cameras, and like the DH.9A before it, could carry a spare wheel for operations in adverse terrain. The prototype first flew on 7 March 1927. Initial tests showed poor control, and the prototype was modified with a much larger tail and horn-balanced ailerons, solving these problems. (It was later discovered that a 2-foot (0.61 m) fuselage section had been omitted from the prototype – as handling was now acceptable, it was not reinstated.) The Wapiti performed well during RAF trials, while using significant amounts of DH.9A components, and was declared the winner of the competition, an initial contract for 25 aircraft being placed in October 1927. After initial production, the wooden fuselage, tail and wings were replaced by metal structures in the Wapiti II and IIA, and the original long fuselage was eventually reinstated in the Wapiti V and later versions. In 1930, Westland produced an updated version of the Wapiti, the Wapiti VII, which differed so much that it was renamed the Westland Wallace. The type entered service with No. 84 Squadron RAF in Iraq in June 1928. It was heavily used in Iraq and India in the Army Cooperation role, acting also sometimes as a bomber or reconnaissance aircraft. Wapitis of No. 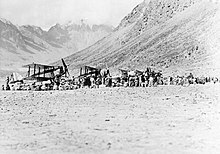 20 squadron escorted Victoria troop carriers in the evacuation of Kabul (the Kabul Airlift) in December 1928. It was still in service in India until 1942. In Britain, Wapitis served with the Auxiliary Air Force from 1929 to 1937. It was also flown by Australia and Canada, where it saw service at the start of the Second World War. The prototype Wapiti V, registered G-AAWA, was used for demonstration flights in Argentina and Uruguay on floats, powered by a 550 hp Armstrong Siddeley Panther IIA engine. It was later modified as the Bristol Pegasus-powered Westland PV-6 or Wapiti VII, re-registered G-ACBR (also known as the Houston-Wallace after the patron Lucy, Lady Houston), for an attempt to fly over Mount Everest. Flown by Flt Lt David F. McIntyre and accompanied by a Westland PV-3 the two aircraft became the first to fly over Mount Everest on 3 April 1933. The PV-6 was later designated the Wallace Mk I, bearing serial K3488 which introduced a number of improvements. A total of 68 Wapitis were converted to Wallace Mk I standard. Royal Australian Air Force – 44 Wapitis were in service from 1929 to 1944. Wapiti I – Initial production version for the RAF. Wooden structure. Powered by a 420 hp (313 kW) Bristol Jupiter VI radial piston engine. 25 built for RAF. Wapiti IA – Improved version for the RAAF. Powered by a 480 hp (358 kW) geared Bristol Jupiter VIIIF radial piston engine and divided-axle main undercarriage. 28 built. Wapiti IB – Similar to the Wapiti IA. Four exported to South Africa. Later re-engined with the 525 hp (392 kW) Armstrong Siddeley Panther. Increased fuel. Wapiti II – Pre-production version with all-metal rear fuselage and wing structure replacing wooden structures of Wapiti I. Powered by Jupiter VIII engine. 10 built. Wapiti IIA – Major production version with tropical equipment and partial dual controls, and able to use wheel or float landing gear. Initially powered by Jupiter VIII. 430 built. Wapiti III – Two-seat general-purpose biplane for the SAAF based on Wapiti IIA. Powered by 480 hp (358 kW) Armstrong Siddeley Jaguar VI or 550 hp (410 kW) Panther VI engines. Four built by Westland followed by 27 under licence in SAAF Workshops. Wapiti IV – Project for Hispano-Suiza 12N powered aircraft with long fuselage for Spain. One long fuselage aircraft designated Wapiti IV may have been delivered to Chinese Warlord Zhang Xueliang in 1931. Wapiti V – Long-fuselage army cooperation version for RAF, fitted with message pickup hook, stronger undercarriage and powered by a 600 hp (448 kW) Jupiter VIIIF. 35 built. Wapiti VI – Unarmed dual control training version for the RAF. 16 built. Wapiti VII – Converted Wapiti V prototype, original designated the Houston-Wallace P.V.6 before reconversion to Wapiti VII experimental aircraft. Wapiti VIII – Long fuselage version for Central Chinese government. Powered by a Panther IIA, four built. A Westland Wapiti (S.No. K-813) survives at the Indian Air Force Museum, Palam, Delhi. It is the last surviving aircraft of the type. The fuselage and lower wing of another (S.No. K-811) reportedly survived at the museum's storage facility but in June 2012 it was confirmed that only K-811's lower wing survives, albeit in a ruinous condition. ^ a b "Aircraft Data Sheet: Wapiti (1927) Wapiti". Westland Helicopters. Retrieved 9 February 2008. ^ Jarrett Aeroplane July 1994, p.59. ^ Jarrett Aeroplane July 1994, p.59–60. ^ Thetford Aeroplane Monthly September 1994, p.17. ^ a b James 1991, p.148. ^ Jarrett Aeroplane Monthly July 1994, pp.61–62. ^ James 1991, pp. 148–149. ^ a b James 1991, p.153. ^ Jarrett Aeroplane Monthly July 1994, p.62. ^ a b James 1991, p.156. Jackson, A.J. (1960). British Civil Aircraft 1919–59 Vol 2. London: Putnam. Jarrett, Philip (July 1994). "Wapiti and Wallace:Part I". Aeroplane Monthly. Vol. 22 no. 7 Issue 255. London: IPC. pp. 58–63. ISSN 0143-7240. Jarrett, Philip (August 1994). "Wapiti and Wallace:Part 2". Aeroplane Monthly. Vol. 22 no. 8 Issue 256. London: IPC. pp. 18–22. ISSN 0143-7240. Thetford, Owen (1957). Aircraft of the Royal Aircraft 1918–57 (1st ed.). London: Putnam. Thetford, Owen (September 1994). "Wapiti and Wallace Service History:Part I". Aeroplane Monthly. Vol. 22 no. 9 Issue 257. London: IPC. pp. 16–22. ISSN 0143-7240. Thetford, Owen (October 1994). "Wapiti and Wallace Service History:Part II". Aeroplane Monthly. Vol. 22 no. 10 Issue 258. London: IPC. pp. 32–39. ISSN 0143-7240. Wikimedia Commons has media related to Westland Wapiti. This page was last edited on 3 December 2018, at 23:08 (UTC).